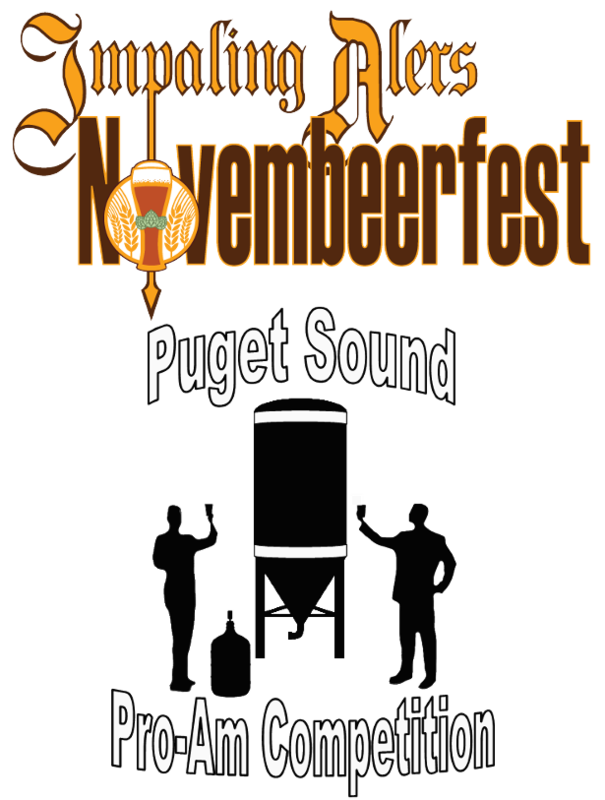 Enter the Joint Novembeerfest, and Puget Sound Pro-Am, one of Washington's longest running homebrew competitions combined with Washington's largest Pro-Am qualifier! The competition will be held, on Friday and Saturday, Novembeer 9th and 10th, 2017. For complete information on the Joint Novembeerfest and Puget Sound Pro-Am, visit http://www.wahomebrewers.org/jnfpspa. This competition is open to all amateur homebrewers. Beer, Cider, and Mead will be judged in accordance with the 2015 Beer Judge Certification Program guidelines. A maximum of 10 entries may be entered per brewer. The ten entries can be entered in just one category or as many as ten categories or any combination thereof. The entry fee per entry is $7.00. All entries MUST be registered online (link available on the competition website) - any exceptions must be coordinated with the competition organizer. Competition helpers (judges, stewards, staff, etc.) get $1 off each entry. Only 10 entries are allowed per entrant. Make checks out to Impaling Alers. The competition organizers reserve the right to close the online registration early if more entries are registered than the judges can adequately judge. (Estimated 500). Brewers must provide 3 brown, 10-12 oz bottles for judging. Each bottle will be labeled with a bottle entry form (from the registration tool) attached with a rubber band (no tape, glue or other labels). Markings on caps will be completely blacked out with a marker. Entries must be collected by a participating club, mailed, or dropped off at Airways Brewery and Taproom by November 4th (desired drop-off period is October 22nd - November 4th ) or dropped off at the locations specified above. Please call ahead before heading to any location to ensure they are open. The AHA/BJCP sanctioned judging will be held on November 10th and 11th. Breweries will select the winners within few weeks of the initial judging. The winners will be announced shortly thereafter with results posted on the competition website. The recipe brewing dates will be scheduled in coordination with the breweries. Pro-Am Homebrewers may not be members of the brewery's staff. The homebrewer brewing their recipe with the professional brewery CANNOT be or have ever been an employee or contractor of a brewery or brewpub by the time of the GABF Registration Deadline.